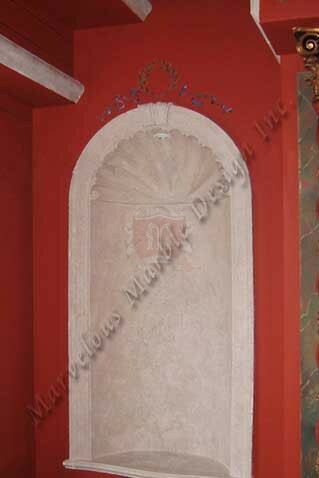 Wall niches are a favorite form of décor or artwork which adorn palatial homes. Most modern custom built high end homes today almost always feature at least a couple of wall niches. The niches are loved for a variety of reasons. However, for your custom built luxury home you can have a limestone wall niche that is totally different from the usual. Conformance, get rid of this word from your vocabulary. This elegant limestone niche does not conform to the norm. The niche is unique in every manner. The base on this magnificent limestone wall niche is large and sturdy. The big space that the base provides is enough for you to place pieces of art on it. Other items which work as décor in your home can also be placed on the base including flower vases and framed family photos. But then, don’t make the mistake of leaving this limestone niche unadorned or filled with random arrangement of items. Crafted from pure Spanish limestone, this limestone niche will fill your home with aged patina as it ages. 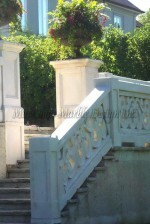 The Spanish limestone used here is strong and durable. The stone has references throughout the world, in some of the most outstanding residences. This lavish limestone creates a more relaxed atmosphere. Designed with royalty in mind, this limestone niche commemorates centuries of architectural innovation. This particular limestone niche is easy to install. The stone from which it is crafted from bonds very well with any adhesive including cement to create a seamless finish. Unlike, the usual wall niches which are normally so high up on the wall, this niche fits perfectly at eye level. The niche displays all the artwork placed on it so that people can see and appreciate the art. This lovely limestone niche is uniquely crafted to bring the warmth of natural stone into your custom built home. 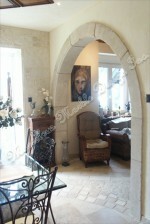 The niche is very beautiful and it works really well in the entry hall where there are really high ceilings. However, the niche’s use is not restricted to the entry hall; you can have it in any other room in your luxury home. If you want this wall niche in a different natural stone or in a different color, just make your request. Custom sizes can also be provided so that it fits perfectly in the space that you would like it to be installed. For more information about this dazzling limestone niche, please call us at 1-888-272-0630, we are always happy to help.